Our beautiful one-acre lush tropical paradise is located south of Hilo and near Kea'au and Pahoa Villages. The upstairs Studio is unique and artsy, with Polynesian decor, looking out at coconut palms, fruit trees... banana, mango, avocado, pineapple and tropical flowers. A piece of paradise to call home while you are on the Big Island. Go to sleep with frogs chirping and stars so bright you could almost touch them. Wake up to birds singing and complimentary Hawaiian coffee . Pamper yourself, shower in our collected rainwater. The Studio Apartment has 1 queen bed and is a bedroom, bathroom and lanai with microwave, fridge, toaster and coffeemaker, wifi and cable. We have a budget friendly 1 Bedroom apts. 1bd apt. has 1 queen bed in bedroom. We are in a residential neighborhood 20 minutes from the Hilo Airport. *Honu Hale 3 offers easy access to east side sites. *3 miles to ocean cliffs, and less than a mile from the main highway. *10 minutes from Pahoa Village. Botanical gardens, rain forest, waterfalls and desert are all part of our unique landscape. Visit our two interesting local farmer’s markets on Wednesday, Saturday and Sunday, where you can get fresh and organic veggies, local artisan hand crafted gifts, yummy ethnic foods and experience the local flavor. We moved here 15 years ago. We love to travel and talk story. Next best is having great guests from all over the world. Loved our time in keeau! Kepi and Jim were great, helpful with local info and genuinely nice people. Our room was romantic we especially enjoyed the lani! Lovely studio in the jungle. Everything was perfect. This lovely studio was amazing. Everything I needed. I was traveling alone so this little cozy place was perfect for me. I felt home and safe. It includes a complete fridge, microwave, toaster, coffe maker, cable tv, towel and even shampoo and soap. 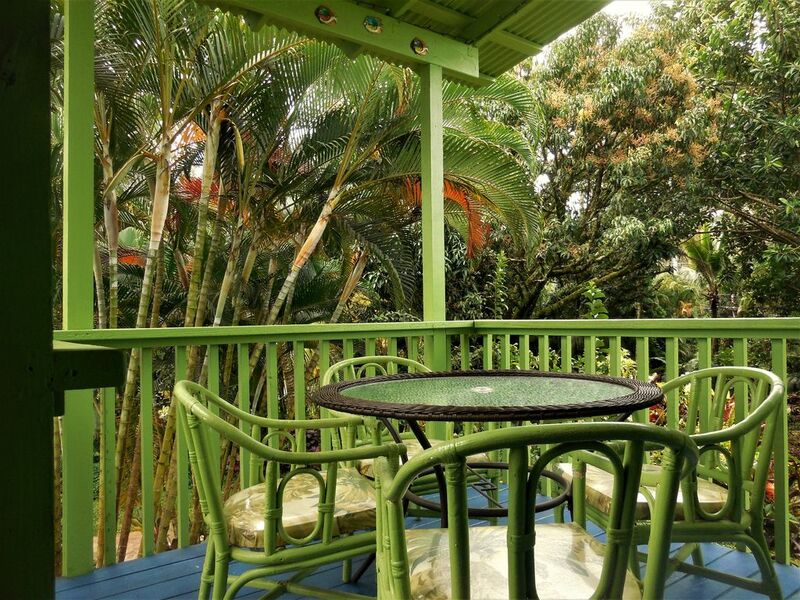 The studio is located on a wonderful propriety on the second floor where you can sit on the lanai. Very good offer for the price. Kepi was really helpful and nice. She was always available when I needed her for an advice or an extra blanket. I would definitely come back to this studio or rent a bigger one on the property for me and my family. Thank you Kepi and Jim! We loved it! Everything about it! Hosts Jim and Kepi are a delight and an inspiration in their love of life and people. We are simple folk who are not about big, fancy hotels with all the trimmings. The was both intimate and quirky, and we would definitely return. Good price. Hosts brought water and tended to a problem very quickly. There were a lot of steep stairs. Other apartments were at ground level. The kitchen was minimal. Other apartments in the building had better kitchens. This one was fine for a short stay for young people and therefore cost less. Very nice for a budget price. Kepi and Jim were very kind and caring. The Appartement was equipped with everything you need, even swimming / snorkeling gear and lovely arranged. Perfect place to explore big island! Mahalo for staying at Honu Hale 3. We enjoyed meeting you folks. Glad you had a good time. I must have gone during the hottest days of the year. It was so hot that I wasn't able to sleep until well into the night when it cooled off. The room is a bit small and compact for me. I am a bigger guy and kept bumping into things as I am used to a bit more room to roam. However it had everything I needed. Location was perfect for my needs, the hosts are very nice too. I would stay there again just have to check the weather. It was extremely hot when Trevor was here. That was the hottest time in all the 15 years we've lived here. Sorry Trevor. I hope you do come back it was nice chatting with you.